Roger Angel is one of the world’s most brilliant and audacious engineers. Could he design the next energy revolution? is a science journalist, whose work has been published in Nature, New Scientist, and Popular Mechanics, among others. His first book is Five Billion Years of Solitude: The Search for Life Among the Stars (2013). The universe is broken into two halves, black and blue. Above, the starry void and the radiant glare of the sun. Below, the Earth is turning, spinning the Americas out of view and into darkness. As the American southwest rotates into twilight, its deserts momentarily blaze with the brilliance of low-angle sunbeams glancing off hundreds of square kilometres of mirrors. The landscape, a sea of steel, silvered glass and photovoltaic arrays, transforms the sunlight and sends it pulsing out into the continental United States as raw power. Every five minutes, every hour of every day, like clockwork, a network of 20 electromagnetic cannons uses trickles of that power to launch streams of three-ton packages away from Earth and into a high orbit. The packages are spacecraft that will ride on pale blue ion jets for months, on their way to a point of gravitational stability between the Earth and the sun, some four times farther away than the moon. On arrival, each package disperses 800,000 gossamer-thin half-metre translucent discs, each weighing no more than a large butterfly. In their accumulating trillions, they form a 100,000-kilometre-wide cloud between the Earth and the sun. Assembled package by package, payload by payload, the cloud will divert some two per cent of Earth-bound sunlight, cooling the planet by a few degrees in a desperate attempt to treat self-inflicted greenhouse fever. Three-quarters of a billion kilometres away, in the orbital vicinity of Jupiter, a 75-metre shard of glass and metal slews and spins in the dark. It is a giant space telescope, built and launched to search for Earthlike planets elsewhere in the cosmos. Sunward, back in the inner solar system, the Earth itself appears as scarcely more than an azure speck of dust glinting in a sunbeam, yielding no sign of its rising seas and temperatures, its collapsing states and species. But some important details can be seen: if it turned to look, the space telescope would glimpse in the Earth’s spectrum signs of plentiful atmospheric oxygen from green plants and whiffs of bacterial methane — our planet’s literal breath of life. Instead, it stares at a distant star, around which it has just spotted a blue planet that appears to have hints of life in its atmosphere. The telescope sends a pixel-sized picture of the planet whispering to Earth on radio waves. Its featureless, formless field of colour will, for a while, make the dark and broken universe seem whole, bound together by the blue seas and skies shared by at least two worlds, and perhaps countless others. The physicist and astronomer Roger Angel awoke from this dream in the clear blue light of an early desert morning. In the bedroom of the home he shares with his wife Eleanor, an hour’s drive outside Tucson, he ran a hand through his hair, once dirty blond, now whitened to electrum, and slipped on silver metal spectacles. Angel has a guarded gaze, as though he were awaiting an answer to a question, or deciding whether a crude joke he’d just heard was funny. Dressed in his standard uniform of loose, low-slung jeans and a chequered collared shirt, sometimes accompanied by a broadbrimmed hat, Angel could be mistaken for a character out of a John Ford western, rather than one of the University of Arizona’s most esteemed professors. Outside, songbirds were already chirping in the branches of the thirsty cottonwood trees and mesquite that lined the green, peaceful river where Angel sometimes walked with his children and grandchildren during their visits. The idyllic view from his window reminded him of his childhood in postwar London, where his family’s house had looked out upon a meadow bordering the ancient woods of Epping Forest. The river was a haven, but it was dying. In the years since Angel had bought the house, the water table had sunk more than a metre as the nearby town of Sierra Vista, even thirstier than the cottonwoods, pumped water away. Angel was certain it would keep falling as the surrounding desert grew more arid under a thickening, man-made blanket of carbon dioxide. Within a generation, the growing towns would drink the river dry. The trees would go to the beetles, and then to the fires, and the green memories of birdsong would drift away on plumes of black smoke. In his autumn years, Angel had come to accept the grim fate of the land around his home. He would probably live only to see the opening stages of this tragic transformation. But when he extended his thoughts beyond his own backyard and lifetime to the lives of his grandchildren and the changes sweeping over the whole world, he became too terrified and too angry to acquiesce. Instead he chose to act, in the only way he knew how. Define the problem. Study its intricacies. Weigh the costs and benefits of possible fixes. Devise an efficient and economic solution. Angel had decided, as he put it to me later, to find a way to ‘cool the bloomin’ planet’. Angel is one of the world’s foremost experts in optics, the science of manipulating light with mirrors, lenses, and gratings. It’s an expertise that echoes through each highlight of his long and varied career. His signature achievement is the University of Arizona’s Steward Observatory Mirror Lab, which occupies a cavernous space beneath the Wildcats football stadium. Following recipes concocted by Angel and a few colleagues, the Mirror Lab makes 8.4-metre mirrors for giant telescopes. They are said to be the world’s largest, most nearly-perfect glass mirrors, bigger and better than most previous experts had thought possible. Angel gave me a whirlwind tour of his Mirror Lab last spring. The facility is divided into three main sections, and the heavy mirrors, mounted in giant metal rings, are moved between them by a crane or, sometimes, a hovercraft. The first section houses the great rotating furnace where each mirror has its genesis. To make a mirror, the furnace spins 20 tons of molten, low-expansion borosilicate glass. The liquid glass spreads out like water in a spinning bowl, thicker at its edges as though it were a whirling disc of pizza dough. The furnace spins for weeks, allowing the glass to cool and set into a nearly perfect paraboloid, an ideal surface for catching light. Angel came up with the idea in 1980, while tinkering in his backyard. He built his first tiny rotating furnace there, and used it to spin out small paraboloid discs made from melted Pyrex cookware. The second section of the lab contains computer-controlled milling and polishing tools. These use substances such as iron oxide, tree resin and Silly Putty to sculpt the mirror surfaces into shapes approaching mathematical perfection, initially rubbing away at most one micron, one thousandth of a millimetre. After more than 50 polishing runs spanning hundreds of hours, the tools will shave away only 10 nanometres of glass per stroke. Despite their delicate touch, the tools are imposing, multi-ton objects that dwarf their human operators. The third section is a test tower — 500 tons of concrete and steel, draped with lasers, projectors and reflectors that shine variegated patterns of light upon each mirror to check for proper polishing and curvature. The tower extends 28 metres up, into the roof, to the vicinity of the largest mirrors’ focal points, and down, below the floor, to gargantuan airbags that isolate it from vibrations in the surrounding environment. Mind you, not even these airbags are proof against sporting passion: no testing can take place on game days, because the movements of the crowds in the stadium above register on the sensitive equipment. Each 8.4-metre mirror must be polished and validated to an accuracy of five nanometres — five billionths of a metre — across its entire reflective surface. If one were scaled up to span North America from coast to coast, its tallest hill would be just over 2.5 centimetres high. 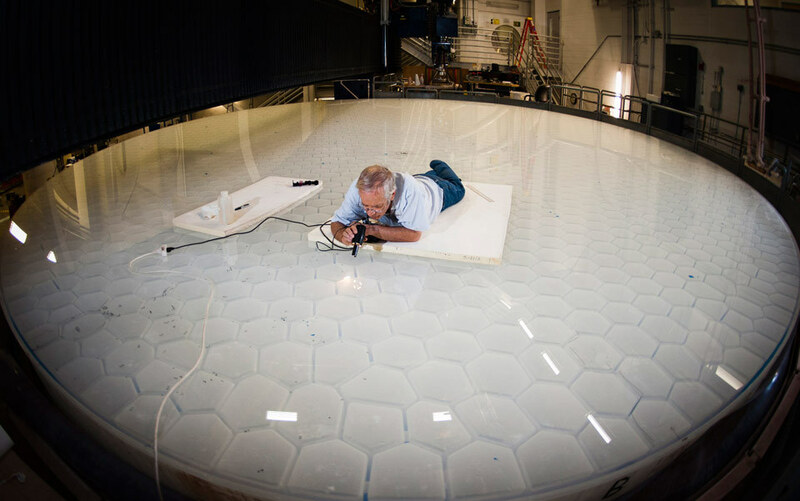 The Mirror Lab has made more than a dozen giant mirrors, and the current production rate is about one a year for $25 million apiece. For a fraction of the money that flows through the stadium overhead, Angel has crafted in his cavern an industrial facility unique on this planet, perhaps even throughout the cosmos. It may have been Angel’s concern over possible mirror-makers elsewhere in the universe that led him to his next big project. In the 1990s, when planets were first discovered orbiting other stars, astronomers had struggled mightily to devise ways to zoom into potential Earthlike worlds, since each hovers like a firefly against its 10-billion-times-brighter star. Angel and a fellow UA professor, Neville Woolf, solved the problem with refined telescope designs that operated in the infrared, where the planet-star contrast was an order of magnitude more favourable. They envisioned a telescope composed of several interlinked metre-scale mirrors stretched out on a 75-metre boom, operating from an orbit beyond Jupiter, where there is less light-scattering dust. Such a telescope remains unbuilt, thanks to its estimated cost of several billion dollars, but if and when astronomers do snap pictures of alien earths, the telescopes they use will almost certainly have been shaped by Angel’s ideas. Like his huge mirrors for ground-based observatories, Angel’s giant space telescope would not save this planet, but someday it could find others. In the first decade of this new century, Angel began to shift his focus from planets around other stars to the planet that we live on, the planet that was growing parched and crowded before his eyes. He has spent years devising a three-decade plan to build and launch 16 trillion tiny, autonomous spacecraft to form a sunshade to cool the Earth to pre-industrial average temperatures, thus counteracting anthropogenic greenhouse heating. The associated expenses would amount to some $5 trillion, although Angel hastens to point out that this would constitute less than one per cent of the world’s gross domestic product for the project’s duration — a bargain compared with the much higher projected costs of allowing global warming to proceed unabated. No one could find technical flaws with Angel’s audacious plan: the physics was eminently feasible. It was also meticulous. Angel had considered practically every relevant physical variable and technological scenario. Even so, he considered it little more than ‘a Band-Aid’, something that could buy perhaps a century of cooler temperatures. More sustainable long-term adaptations would be needed to deal with the recent spike in greenhouse gases, which promise to linger in the atmosphere for tens or hundreds of thousands of years. ‘The sunshade may seem like mad science,’ he quips from time to time, ‘but the fact is, we live upon a mad world.’ Not mad enough, however. Not yet. Few would seriously contemplate building anything like Angel’s sunshade until catastrophic warming and sea-level rises are already well under way, and by then, it may be too late. Angel himself prefers that it never be built at all. He believes that cutting carbon emissions would be considerably cheaper in the long run. To that end, Angel has been working on a new project since 2008, an effort less ambitious than blotting out the light of the sun but audacious enough. He wants to make grid-scale solar power that costs about a dollar per watt — as cheap as or cheaper than electricity from burning coal or other fossil fuels. Moreover, he thinks he has found how to do it, and has even formed a company, REhnu, to gather capital investment and develop the necessary technology. In years to come, if Angel has his way, his proprietary system of gleaming mirrors and flashing lenses will transform the American southwest and other sun-drenched regions into the 21st-century powerhouses of the globe, driving markets to leave all the world’s remaining coal in the ground. He has attracted several research grants from government agencies, as well as a considerable number of backers from the upper echelons of US astronomy and energy research who, having seen Angel build the Mirror Lab from nothing, prefer to bet with rather than against him. The cornerstone of REhnu’s business plan — Angel’s proof-of-concept ‘gadget’ — is a gangly steel trellis sitting behind a gym on the UA campus. The trellis holds a three-metre square of silvered float glass — the same cheap, thin glass used in household windows and mirrors. A small motor turns the trellis to keep the mirror pointed directly at the sun moving overhead. The mirror concentrates the sunlight by some 25,000 times and directs it into a durable sphere of fused borosilicate glass, a ball lens that glows like a miniature star as the concentrated beam of solar photons shines through. Place a half-centimetre-thick steel plate at the beam’s focus instead of the ball lens, and you will witness its power. Within three seconds, a dull red disc appears on the reverse of the plate; after four, it is bright crimson; five, orange; six, yellow; seven, white. In another second, the light bursts through as molten metal hisses on to the concrete below. The ball lens regulates the beam down to 1,200 times the potency of regular sunlight, and uniformly redistributes the three square metres-worth of gathered photons across just over 50 square centimetres of water-cooled triple-junction photovoltaic cells, the high-efficiency sort used by communications satellites and interplanetary spacecraft. Photons slam into the black cells, knocking off electrons that trickle out as usable current. Angel’s gadget converts almost 40 per cent of the energy from gathered sunlight into electricity in this way, and the rest pours off as waste heat. ‘The problem with sunlight is, it’s all the energy you’d ever want, just spread out over a really big area,’ he told me when we first met in Tucson. ‘At full brightness and perfect efficiency, the sun gives you on the order of one kilowatt per square metre. That means theoretically, if everything is perfect, you get one gigawatt of power — a big coal-fired power station’s worth — from one square kilometre. But everything isn’t perfect, so you’re looking at more like 10, 20 square kilometres for that gigawatt right now. The trick, Angel believes, is to build the system much as you would a telescope, designing it with elegance and precision to use as much sunlight as efficiently as possible to generate power. Beneath the stadium, Angel showed me the Mirror Lab’s two main projects at present. In one corner, the 8.4-metre mirror of the Large Synoptic Survey Telescope was in the midst of the polishing phase. The mirror has a unique double-curved surface — a relatively flat outer torus and a deep central bowl — that gives it an extremely wide field of view. Paired with a 3.2-gigapixel digital camera, the LSST will image the entire overhead sky in high resolution and with exquisite sensitivity every few nights, after it achieves first light (astro-speak for starting its working life) in 2020 on a Chilean mountaintop. The LSST data set will be the most expansive time-lapse movie ever made, encompassing essentially all that exists between the telescope’s windswept perch and the edge of infinity, the far end of the observable universe. It will discover untold numbers of new asteroids, comets, and other small bodies in the solar system, and, farther afield, record the echoes of enormous numbers of flaring and exploding stars that would otherwise sparkle and fade unseen. It will measure the influence upon cosmic structure of dark matter and dark energy to new levels of precision. Its most profound discoveries will inevitably be those that no one has predicted, for never before has anyone possessed such an expansive and dynamic view of the heavens. The Mirror Lab’s remaining sectors are taken up by an even larger project, the Giant Magellan Telescope, which will string together seven of Angel’s 8.4-metre mirrors into a vast light-gathering surface some 25 metres across. That great bowl will collect more celestial light and yield higher resolutions than any other telescope ever built, and, among other things, is meant to search for signs of life on a handful of extrasolar planets around nearby stars. The first GMT mirror was wrapped in blue plastic, ready to be unleashed; the second was being prepared for polishing with diamond-grained grinders; the third would soon be cast in the rotating furnace, and the rest will follow over the next several years. Adjacent to the wrapped GMT mirror, Angel had tucked away a small workstation for shaping REhnu’s four-millimetre-thick float-glass mirrors. Each flat plane of glass naturally slumped into a light-gathering curve beneath red-hot heating elements, then rapidly cooled under jets of compressed air. It was a process ready for incorporation into an industrial assembly line. Like all great works of engineering, Angel’s projects are not so much lofty visions of perfection as they are elegant compromises. He is keenly aware that, even more than the fundamental laws of nature, the stirrings of the human heart are what place the strictest limits upon his Mirror Lab, his sunshade, and other imaginings. He works best at the blurred line between the possible and the practical, crafting solutions for things most people don’t even recognise as problems. From time to time, one can glimpse outlines of Angel’s dreams for the future sketched in the margins of his fantastic designs. During our conversations, Angel showed me a paper he had co-authored that examined the fine details of making mirrors from spinning pools of liquid mercury. In cavernous, permanently shadowed craters at the moon’s south pole, such a mirror could gaze deeper back into cosmic time and space than any optical telescope ever conceived, gathering light that had travelled unchanged across the observable universe, from the seething hearts of stars that perished billions of years before our solar system had even begun to form. With such a mirror, one could hope to glimpse not only the origins of the universe, but also its destiny — whether it will continue to expand explosively, reach eternal stasis, or perhaps even collapse back in upon itself. Almost as an afterthought, when Angel talked about liquid lunar mirrors and the fate of all things, he mentioned that in the vicinity of the permanently shadowed craters there were also peaks of eternal light, where the sun never dipped below the airless horizon. Such a place would be ideal for solar power generation and, Angel hinted, a marvellous site for future settlements on the moon. A surprising simplicity governs most of Angel’s seemingly outlandish proposals, whether it is to cool a planet, power civilisation or extend human presence off-world. In essence, they distil down to clever ways of maximising efficiency in collecting, concentrating, channelling, or diverting the energy radiating from a star. Whether or not they will ever leap out of Angel’s intracranial vistas and into reality is not really a function of science or technology, but of ethics and society. Which aspects of the human experience do we most value and cherish? What feats do we collectively celebrate, and strive with every fibre of our beings to achieve? Pondering this while looking up from the busy work floor of the Mirror Lab, it seemed terribly sad and entirely appropriate that any view of the open sky was cut off by the hulking weight of an overlying football stadium. After showing me the Mirror Lab, Angel invited me to an on-campus dinner, a gathering of experts from academia, industry and government that he had been invited to address. His audience had come to Tucson to discuss ‘smart grids’, agile and flexible continent-scale power grids that promise to make the production and distribution of electricity more sustainable, reliable and economical — if ever they are actually implemented and built. The topic is painfully near to Angel’s heart, because the existing ‘dumb’ grid is REnhu’s most troubling Achilles heel. Without being linked to national smart grids that accommodate shifting loads from sunless nights and cloudy days, the clean, free, plentiful energy of the sun would never be more than a footnote in an accounting of global electricity production and use. Like Angel’s other pursuits, smart grids are deceptively simple: Existing tools and technology make their construction eminently feasible, and their operation would greatly benefit every person on the planet, yet for some reason they remain stubbornly, sluggishly unbuilt. Most of the guests wore suits; true to form, Angel had opted for saggy jeans and his trademark chequered shirt. He started his presentation with an apology for interrupting dinner, then, aided by illustrative slides, explained his background, initially struggling to be heard over the buzz of conversation and the clinking of cutlery on plates as the guests continued enjoying their steak and wine. Soon he was laying out the ‘hideous’ realities of climate change, and the room had become quieter. Angel argued that a US national grid should have its diffuse heart in the sun-blasted deserts of the southwest and the windswept ranges of the Rocky Mountains, where sun and wind power were plentiful and could be easily harvested. The Rockies would serve a dual purpose — in addition to providing wind power, they would store up solar power using a system of deep reservoirs and high peaks. Using an estimated 13 grams of aluminium per watt to minimise losses, the high-voltage lines would deliver electricity to New York City from the Rocky Mountain powerhouse with 90 per cent efficiency, bringing the total cost of each watt delivered through the grid to well below a dollar — the magic number for renewables to overtake fossil fuels. A short while later, a man in the audience scoffed that high property values and the difficulty of obtaining rights-of-way made Angel’s plan a non-starter. To grasp the global danger of climate change, one need only realise that a man as thoughtful and gentle as Angel would, after weighing the options, vastly prefer the authoritarian subjugation of individual freedoms to a warming planet. The construction of an American smart grid in accordance with Angel’s plan would itself be a profound ecological disruption, though one far smaller in scale than rising soda-water seas and parched, uninhabitable equatorial regions. To save nature as we know it on this planet, he seemed to be suggesting, we first have to destroy a great deal of what remains of it in the US. Thinking back to Angel’s desert river, I wondered for a moment where songbirds might nest within horizon-to-horizon expanses of sun-baked glass and steel. The evening wound down with tepid comments and questions from the audience. One of the smart grid experts suggested that nuclear power could experience a renaissance by having all its associated radioactive waste ‘simply’ launched into space. Another approached him after the talk and suggested we would all be better off with technologies no more advanced than those of the ancient Greeks. A third chided him for the gloominess of his presentation. Angel had not eaten, and gathered some leftovers into a doggy bag. As we left, he offered to drop me off at my hotel. We walked from the venue to his vehicle, a battered old pickup truck, and drove off into the warm desert night. I asked Angel whether he ever suffered from existential frustration, whether he ever grew tired of building tools and plans for which the rest of the world was not quite ready. Thinking back, he could almost have been talking about Earth itself, or at least how most people relate to it. A great ball of rock and metal 12,000 kilometres in diameter spins endlessly around a thermonuclear fireball more than a hundred times as large, all for no other reason than to support a vanishingly thin surface layer, a light-gathering sheen of life; a ball from which a few beings, privileged and flawed, can from time to time gaze up and reflect.